Model D11005-000 Voltage Multiplier and Divider Card is designed for applications where the multiplication or division of DC voltage signals is required. The D11005-000 has two isolated input channels which are also isolated from the output. Each input signal is conditioned by scaling circuits which can be modified via on- board multiturn OFFSET, GAIN and BIAS Potentiometers. The final output after the multiplication or division stage can also be modified by OFFSET, GAIN and BIAS Potentiometers. Terminal strip connections are provided for a Trim Potentiometer, 2 Auxiliary Inputs, Summing Input and Meter Output. A single turn TRIM RANGE adjustment is provided to limit the range of the external Trim Potentiometer. A METER RANGE adjustment is provided to limit the range of the meter output. 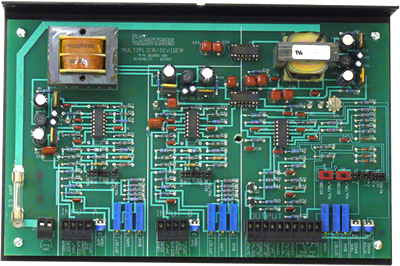 The Output Circuit can be configured to source either a voltage or a current. Typical output ranges are -10 to +10 VDC, 0 to 20mADC, or 4 to 20mADC.